Sonoma County is truly fortunate to host within its borders such a stellar theater-arts training program as SRJC's annual Summer Repertory Theatre. Each summer brings a new crop of actors and crew members, and those of us who make the pledge to see all five shows often become fans of particular players, rooting for this actor or that singer, whom we get to see performing in a range of roles, large and small, over the course of two months. Some of the shows, of course, turn out to be stronger than others, but part of the SRT experience includes walking away from a weaker show happy that we were able to see one of our favorite performers shining in an otherwise unfocused or unevenly carried-out production. Such is the case of the cute-as-a-button but not-as-solid-as-the-other-shows musical Snoopy, which opened last weekend, the fourth of this season's shows to debut. The primary reason to see Snoopy is Sarah Michelle Cuc as Peppermint Patty. Having already made a strong dramatic impression as Mary Warren in The Crucible and as a comic actress in several roles in The Women, Cuc, who comes to SRT from Santee, Calif., demonstrates in Snoopy that she also has a powerhouse singing voice. It's safe to say that we can expect good things from Sarah Michelle Cuc in the future. Snoopy, based on the beloved cartoons and characters of Charles M. Schulz, is something of a sequel to the better-known You're a Good Man, Charlie Brown, only with more and better songs, this time by Larry Grossman and Hal Hackady. Essentially plotless, it covers a year in the lives of Charlie Brown, Linus, Lucy, Sally and especially Snoopy, Charlie Brown's imaginative, wannabe-novelist dog. Nothing much happens, of course, but then nothing much happened in Schulz's strip. Snoopy tries to write a novel and waits for each new rejection letter, he pines for his long-lost mother and he stages satirical sock-puppet shows for the kids in the neighborhood. The kids go to school, worry about things, swap witty kidlike insults and make tentative attempts at reaching out to one another. What we get, basically, in Snoopy is a series of musical performances illustrating the daily grind of being a kid without much to do, each song stitched together by short and joke-filled sketches, many lifted directly from the panels of Schulz's comic. 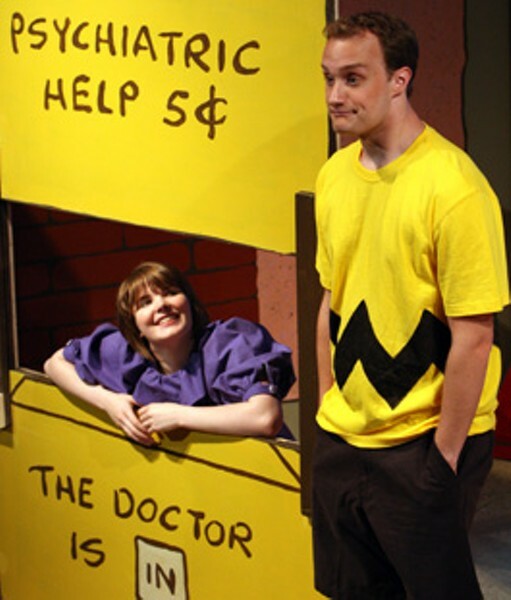 In the SRT production, competently directed by William McNeil, Cuc nicely displays the awkward uncertainty of being Peppermint Patty, one of the "odd kids," alternating between openly expressing her befuddlement with school and homework, and her passive-aggressive affection for Charlie Brown (Brian Watson). When she sings the wonderful song "Poor Sweet Baby" to Charlie Brown, she shows serious singing chops. Also good are Zach Raino as Snoopy (acrobatically leaping on and off that iconic doghouse, displaying solid comic timing in his interactions with other characters) and Jimmy Robertson as Linus, capturing the sweet intelligence of the kid who can't bear to be apart from his security blanket. Robertson has a nice quick bit when his blanket must be taken away and laundered, and we see various stages of panic play across his face before he finally gets the blanket back and melts with relief. Lucy, the bossy-crabby queen of the neighborhood, is played by Nicole Odell with the right amount of self-assured cluelessness, and as Charlie Brown's sister, Sally, Raquel Cockrell has some strong, funny moments of her own. That said, this is one of the inherent problems with the "Peanuts" plays: it's always weird to see adults playing kidlike voices and attitudes, suggesting some sort of arrested development or brain damage that doesn't present itself in the strip where the kids look like kids. There are a few other problems as well, though none is crippling. In general, the women of Snoopy all out-sing the men, many of whom wobbled and pitched their way through opening night. The set by Sherry Rahn looks a bit slapped-together compared to the first-rate sets on display in all the other shows, and the musical accompaniment by pianist Lilli Wosk seemed a bit uncertain and off-tempo. Despite these quibbles, Snoopy is mostly enjoyable, and the stunning closing anthem, "Just One Person," had the audience in tears, it was so well staged and performed. 'Snoopy' runs through Aug. 6. July 5, 8&–11, 19, 25&–26, 29&–31 and Aug. 6 at 8pm; also July 5&–6, 9&–11, 19&–20, 26, 30 and Aug. 6 at 2pm; July 6 and 20 at 7:30pm. Newman Auditorium, Santa Rosa Junior College, 1501 Mendocino Ave., Santa Rosa. $8&–$20. 707.527.4343.